There’s nothing like a new day, and a change of scene, to break out of a creative block. Not to mention being surrounded by beauty. Spent the weekend at a friend’s gorgeous, gorgeous farm, soaking up the fresh air, and the view, and the light. Nourishment for body and soul. 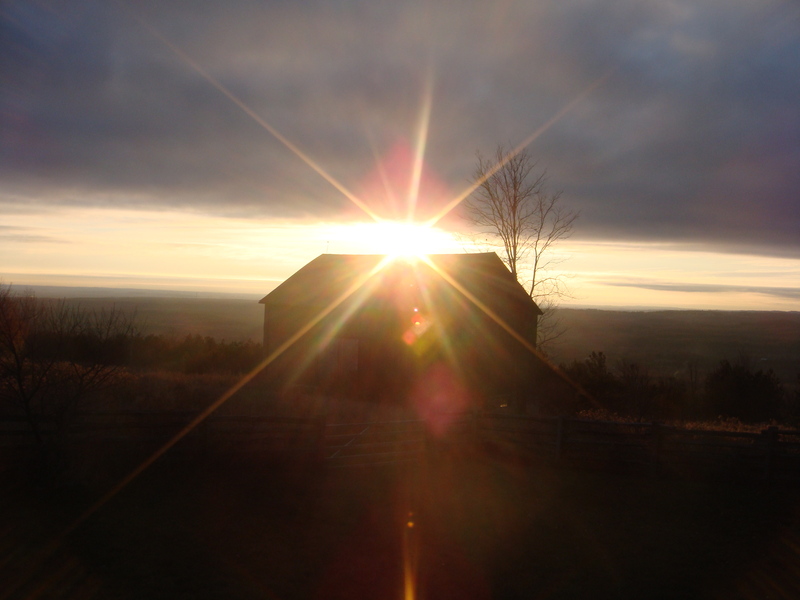 This photograph was taken just as the sun was rising over the barn. And, just before it slipped in behind the clouds. What a beautiful moment in time. A sense of stillness in the midst of constant change. And, I am reminded how much I love the light, and photography, and that there’s nothing like the start of a new day. What a gorgeous photo! I am completely in awe of your ability to capture the sun flare in such a wonderful way. No matter how hard I try, I just can’t seem to capture it in a way that I like. Well done and very inspirational! Seeeeee? 😉 The cycle always comes around again. hehe. I love the sparkliness of this. Like you found a diamond on the roof of the barn. What an exquisitely beautiful capture of the sun’s rise. Good to hear your creative juices are flowing once and again! Visiting from “Creative Exchange”…what a beautiful capture of a sunflare! Simply gorgeous. This could not be more beautiful Juli! Awesome light, awesome capture. Yes, a great moment in time. That must have been a great morning. Thanks for charing. Carola, Thanks so much for coming by…it was absolutely a great morning! Hi, Margaret, Lovely to see you here. Thanks! Perfect timing. A gorgeous shot!